Marijn de Vries Hoogerwerff is a New Media theorist, Web researcher and Internet entrepreneur. In 1999 he started working as IT professional at the broadband Internet Service Provider @home (a franchise of the ISP and search engine company Excite@Home). After working here for over eight years he decided to pursue a study in New Media at the University of Amsterdam. During this study he has been an active member of the Digital Methods Initiative (DMI) research group, working together in a strong team of designers, programmers and theorists to develop new Web-specific methods and tools for doing online research and has written in depth about Internet censorship research, code consciousness and cyber-cosmopolitanism. Next to several stand-alone projects he also started up CYBERLIFE, focusing on building Web-applications, sites and tools, Web hosting and doing Web research. After receiving his Master degree in New Media he continued his contributions to the DMI, has helped organize the Society of the Query conference for the Institute of Network Cultures and has been a thesis supervisor at the University of Applied Sciences (HvA) for Interactive Media. His current company, nochii BV, focusses on utilizing theoretical knowledge and practical experience to help companies get a better understanding about the Web, their network and the space they occupy and its relation to the offline. He holds the strong believe that the Web, both as infrastructure and as concept, can aid in dealing with the increasing complexity of the world (both online as offline) and the relating problematics. 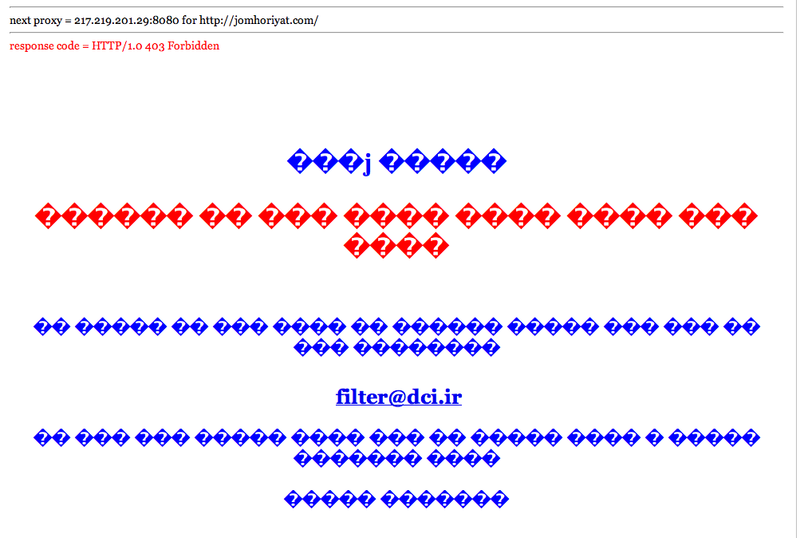 Additionally, this very blog and the Caucasus Institute site seems to experience problems when attempting to access from an Iranian proxy. 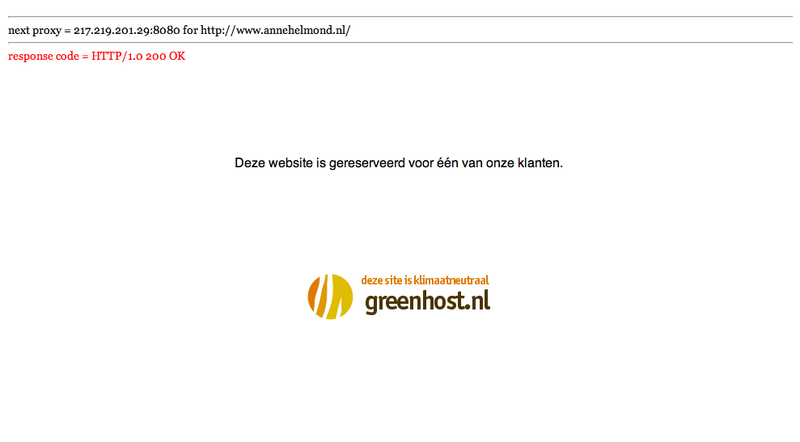 Checking Anne Helmond’s blog, as she has not yet reported about Iran, but might be suspect through affliction, I get a weird redirect to greenhost stating: Deze website is gereserveerd voor één van onze klanten. (has been reserved for one of their customers). Their might be a redirect to avoid an HTTP error, but that is just a guess. As a benchmark I’ve looked up sites such as Google.com and ahmadinejad.ir and they work just fine through the proxy. 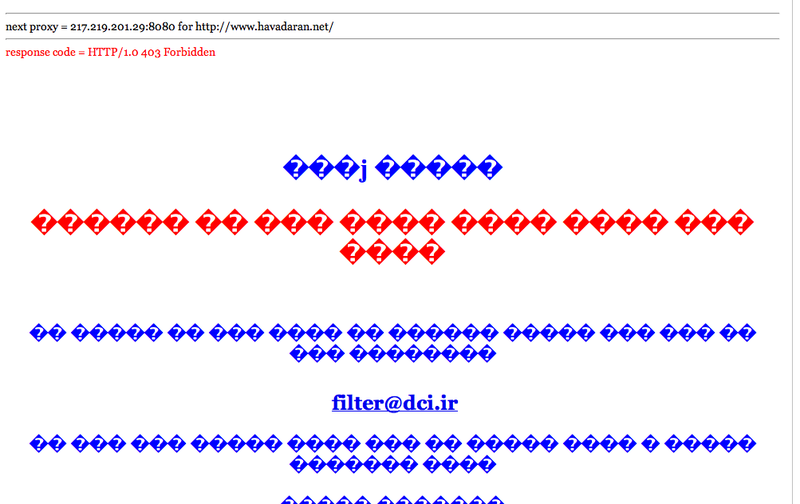 Several Iranian technology companies are now producing hardware and software products for use in the Iranian filtering system. Domestically produced technology is currently used for filtering. Iranian technology is also used for searching the Internet for objectionable content and tracking keywords and links to banned Web sites, which are used by filtering authorities to make blocking decisions. With the emergence of this domestic technical capacity, Iran joins China as the only countries that aggressively filter the Internet using their own technology. Such a improved system would explain the extensiveness and efficiency of the blocking. I have not checked the sites mentioned here prior to today, so it’s difficult to say anything conclusive about when filtering might have been initiated. Further more it must be noted that the use of the open Iranian proxy must be interpreted as an indication and cannot really be seen as hard evidence. The result images are below. I think Mir Hossein Mousavi is too open minded for the Irani government and they will do anything to stop him, including these kind of acticities.